I have created a free score prediction game for the UEFA Futsal Euro 2018 (30th Jan – 10th Feb, games live on YouTube in the UK) called Futsal Predictor where you can win some top prizes kindly provided by Umbro. The motivation behind investing significant time and money in creating this is to encourage people to follow elite futsal more closely. The numbers playing continue to grow rapidly across the world and the convenient and fun nature of the sport mean this trend will only continue. However, I still see a lack of interest in the highest level which is hindering its development. I know many professional and international players, never mind young players, that don’t follow the game. This would be unheard of in other sports and elite futsal needs to become more accessible and appealing. By attracting more people to futsal, we not only give more opportunities for people to enjoy the spectacular entertainment it offers but create a sport that generates its own revenue to fund its development. Something that is key to achieve the sustainable source of investment we require. Further, we need to create idols of our own superstars. This is not only what they deserve for their talent but also provides inspiration for youth players to commit and play the game. A personal ambition of mine over the next few years is to make as big a contribution as I can to building our elite game, which requires better presented competitions that are very easy to follow and find information on. The Futsal Predictor Game is a small initiative to achieve this objective. By playing this game everyone will have an interest in the results of the matches. Not only will this increase attention in the short-term but encourage finding out about the stories and characters behind the elite level that is necessity to becoming a long-term fan. As well as some great prizes, the game offers the opportunity to create Private Leagues. It is more enjoyable to follow something when you share and discuss that passion with others. My hope is that groups of friends, clubs, media organisations and others will create and promote their own leagues to help build their own communities and the wider futsal community. If you would like to support this initiative then please register now at FutsalPredictor.com and share that you are playing across your social media as well as follow and share content from the Futsal Predictor accounts (YouTube, Facebook, Twitter, Instagram). 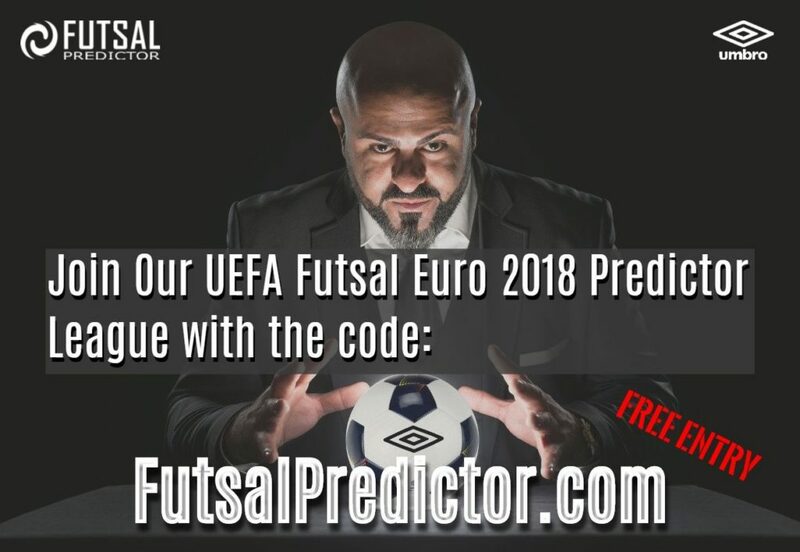 Join our UEFA Futsal 2018 Predictor League! If clubs and other organisations do this then that would be even better and by building the interest in the game I am sure it will also help you strengthen and grow your own futsal community. You could even offer your own small prizes for the winners. I have included the following poster you can use to help share your league (add your code & please feel free to add your club logo). Look out for my own UEFA Futsal Euro 2018 guide coming soon and I will be covering the tournament before and throughout with both video and commentary on the Futsal Predictor Social Channels (YouTube, Facebook, Twitter, Instagram). Thanks, enjoy the championships & good luck in the game! !